Ronne passenger and car ferry ticket prices, timetables, ticket reservations and information for ferries sailing from Ronne to Koge, Sassnitz and Ystad. Compare all available Ronne ferry ticket prices in real time and book the cheapest available Ronne car and passenger ferry tickets sailing to and from Ronne, Koge, Sassnitz and Ystad with Bornholmstrafikken Ferry Line ferries online with instant confirmation. Book Ronne Ferry Tickets with Bornholmstrafikken Ferry Line for ferries sailing from Ronne to Koge, Sassnitz and Ystad online in advance to enjoy the cheapest available ferry ticket price. The price you see is the price you pay. There are no hidden extras or surprises such as added fuel surcharges or booking fees and we do not charge you anything extra for paying with a Visa Electron card. The price we quote you for your selected Ronne passenger or car ferry ticket, onboard accommodation and vehicle type is all you will pay, and that's a promise. To obtain a Ronne ferry ticket price and book your ferry ticket securely online please use the real time ferry booking form on the left. You are also able to add a hotel at your destination, or anywhere else, to your ferry ticket when completing your ferry ticket reservation. Rønne is the capital of Bornholm, a tiny island to the east of Denmark characterised by sandy beaches in the south and craggy cliffs and hilly landscapes in the north. Rønne was founded in the 13th century and was once an important Baltic trading post. The town grew up around its natural harbour and today the population lives by fishing, farming and, increasingly, tourism. Approaching Rønne from the sea, you will see St Nikolai’s church on the hill just above the port. Close to the harbour, in Laksegade, there is an enchanting area of rose-clad, half-timbered 17th and 18th-century houses, including the terracotta-roofed Erichsen's Gaard. The oldest building in Rønne is situated near the harbour and was originally constructed as a warehouse for storing provisions for the Navy. The oldest theatre in Denmark, built in 1823, is in Rønne and the ruins of one of northern Europe's largest castles are to be found nearby, at Hammerhus. Few travelers choose to stop at Ronne when traveling to Denmark, and those that do often go to see the Ronne. Those traveling through the area most often go to more well-known destinations but there is a lot of interest in Ronne. The colourful old quarter is very nice, quiet and clean with loads of quaint shops and restaurants. Inland and by the church, the unusual location for the lighthouse is easy to understand - the port is there, adjacent to town. Dating back to 1880 is close to the new modern port of Rønne. In the past when the port was less commercial this was the guiding light through the Baltic Ocean and to the entrance of the port of Rønne. It may be considered a landmark, since behind it unfolds the beautiful old Ronne's quarters. One of the larger old buildings in the old town centre is the beautiful mail post office. It is a large brick building with decoration and the seal of the island below the roof. In front is the little park and the square of Lille Torv. The second square is closer to the old town of Rønne and gives more of the old charm of the town. A park is situated in the middle of the square and the main post office is towards the end. Several cafes and shops surround the square. The larges square in the city of Rønne is Store Torv. The square accommodates a large parking area and is lined by bars, restaurants and cafes as wells shops and banks. It is a good orientation point to the centre of town. Erichsens Gård is located in Laksegade. It is a museum consisting of a house and garden depicting an upper-class citizen’s home as it appeared in the last half or the 19th century. A great view into the daily life of people living on the island some 200 years ago. The renowned Hjorths Keramikfabrik was built in 1859 and is situated in Krystalgade. Today the factory is a ceramics museum with demonstration workshops. The descendents of the Hjorths dynasty are still creating beautiful are there today. A building from 1823 is the home of the oldest functioning theatre in Denmark. Every year part of the repertoire includes the successful performances during the annual summer revue. The oldest building in Rønne is at Talbodgade 1 situated near the harbour and was originally constructed as a warehouse for storing provisions for the Royal Navy. The plank doors are believed to originate from Hammershus. Rønne is the main port of arrival for most ferries to Bornholm (and also has the island's main airport) so whether you come from mainland Denmark, Sweden, Germany or Poland you end up here. 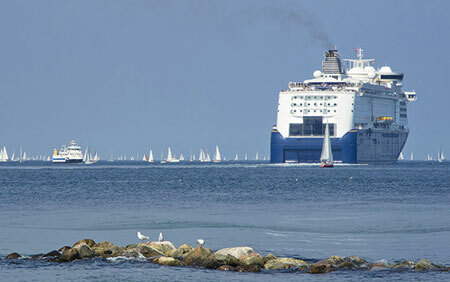 The exceptions are the summer ferries from Sweden to Allinge and Poland to Nexoe. The island offers a good network of roads that circles the island as well as crosses it on a number of places. Good signage is available throughout the island. The island of Bornholm is a cycling paradise. All around the island one can find plenty of cycling paths that are separated from the normal roads. There are shops available to hire bicycles and at the tourist information centres one can purchase maps with an overview of all cycle paths. Best Price Guarantee - We always offer you our lowest available Bornholmstrafikken Ferry Line passenger and car ferries ticket price to and from Ronne. There are no hidden extras or surprises such as added fuel surcharges or booking fees and we also we do not charge you anything extra for paying with a Visa Electron card. The price we quote for your selected Ronne ferry ticket, onboard accommodation and vehicle type is all you will pay, and that's a promise! In the unlikely event you find the same all inclusive Ronne ferry ticket cheaper in the brochure of any other tour operator we promise that we will do our best to beat that price or offer you the choice of requesting a refund. To book Ronne car and passenger ferry tickets please click here. At ferryto.co.uk you are able to obtain live Ronne ferry ticket prices, check availability and book car and passenger ferry tickets to and from Ronne at our lowest available ticket price. Ferryto.co.uk is part of the world's largest online ferry ticket distribution network providing the ability to book over 80 major European ferry operators including to Ronne and to over 1,200 other ferry routes throughout the UK, France, Spain, Ireland, Holland, Eastern Europe, the Mediterranean, the Baltic and North Africa.